Rogers graduated from Pittsburgh Theological Seminary and was ordained a minister of the United Presbyterian Church in 1963. In 1963, CBC in Toronto contracted Rogers to develop and host the 15-minute black-and-white children's program Misterogers; it lasted from 1963-1967. It was the first time Rogers appeared on camera. Head of CBC's children programming Fred Rainsberry insisted on it, telling Rogers, "Fred, I've seen you talk with kids. Let's put you yourself on the air." Coombs joined Rogers in Toronto as an assistant puppeteer. Rogers also worked with Coombs on the children's show Butternut Square from 1964–1967. 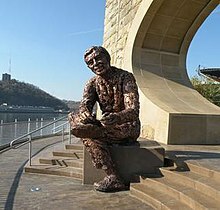 Rogers acquired the rights to Misterogers in 1967 and returned to Pittsburgh with his wife, his two young sons, and the sets he developed at the CBC back with him, despite his potentially promising career with the CBC and no job prospects in Pittsburgh. (Coombs remained in Toronto, creating the long-running children's program Mr. Dressup, which ran from 1967 to 1996.) Rogers' work for CBC "helped shape and develop the concept and style of his later program for the Public Broadcasting Service (PBS) in the U.S."
Rogers based the show on his Christian values, but never explicitly mentioned his faith on the show. "He wasn't doing that to hide his Christian identity," Junlei Li, co-director of the Fred Rogers Center, explained. "I think Fred was very adamant that he didn't want any viewer — child or adult — to feel excluded from the neighborhood." In 1969, Rogers appeared before the United States Senate Subcommittee on Communications. His goal was to support funding for PBS and the Corporation for Public Broadcasting, in response to proposed budget cuts. In about six minutes of testimony, Rogers spoke of the need for social and emotional education for children. He argued that alternative television programming like his Neighborhood helped encourage children to become happy and productive citizens, sometimes opposing less positive messages in commercial media and in popular culture. He recited the lyrics to one of his songs. Rogers met Sara Joanne Byrd (called "Joanne") from Jacksonville, Florida, while he attended Rollins College. They were married in 1952 and remained married until his death in 2003. They had two sons, James and John. According to biographer Maxwell King, close associates said that Rogers was "absolutely faithful to his marriage vows." Also according to King, in an interview with Rogers' friend William Hirsch, Rogers said that if sexuality was measured on a scale, then: "Well, you know, I must be right smack in the middle. Because I have found women attractive, and I have found men attractive." Rogers became a vegetarian in the 1970s, saying he couldn't eat anything that had a mother. He became a co-owner of Vegetarian Times in the 1980s and said in one issue "I love tofu burgers and beets". Though he largely avoided politics, Rogers was a lifelong Republican. In reference to Donald Trump, his widow Joanne has stated that "his values are very, very different from Fred’s values - almost completely opposite." According to her, if Rogers were alive, "he might have to" speak up against modern political leaders whose values he differed from. Rogers was diagnosed with stomach cancer in December 2002, and underwent surgery in January 2003. A week earlier, he had served as grand marshal of the Tournament of Roses Parade, with Art Linkletter and Bill Cosby. 1 2 3 Maxwell King (4 September 2018). The Good Neighbor: The Life and Work of Fred Rogers. ABRAMS. pp. 208, 379. ISBN 978-1-68335-349-2. ↑ Obis, Paul (November 1983). 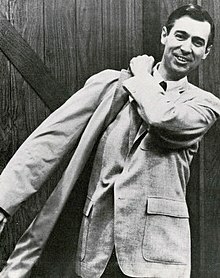 "Fred Rogers: America's Favorite Neighbor". Vegetarian Times. Retrieved 2019-03-07. ↑ "Fred Rogers". Biography.com. 2019. Retrieved March 4, 2019.